Louisiana may soon lose its title as the world’s leader in incarceration. Bipartisan lawmakers and a diverse coalition of advocates overhauled the state’s criminal justice system. The reform passed this legislative session will reduce the time people spend behind bars, set them up to be more successful when they return to their communities and diminish the likelihood they will return to prison. It will also result in savings that will be used to improve public safety. Those are big changes for a state that incarcerated 776 people per 100,000 residents in 2015 – far beyond the national rate of 458, according to Justice Department data. Over the next decade, Louisiana’s incarceration rate is expected to drop 10 percent, and the population on parole or probation is expected to drop by 12 percent. The state will save $262 million during that time. The SPLC is dedicated to fighting harsh sentencing practices across the South. Working as part of the Louisianans for Prison Alternatives coalition, the SPLC helped win support for criminal justice reform by taking the message of change to residents and lawmakers through town halls and a rally at the capitol that drew 600 people. The result was the passage of reform crafted from the recommendations of a task force that reviewed and analyzed Louisiana’s criminal justice system. Below are highlights from the 10-bill justice reinvestment package Gov. 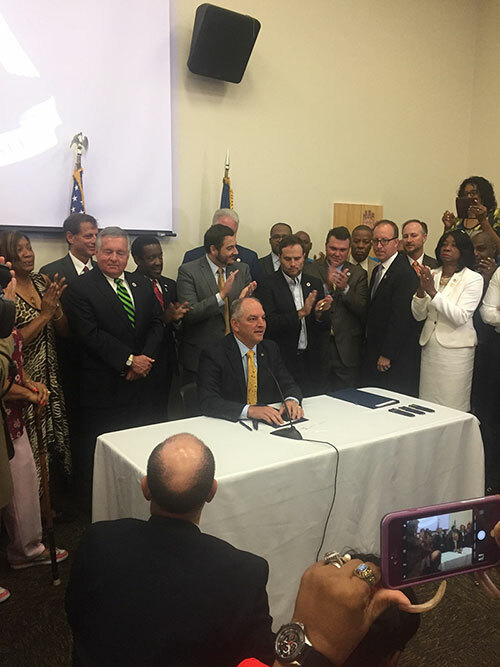 John Bel Edwards signed into law Thursday. Reduce maximum sentences for several crimes. Eliminate mandatory minimum sentences on certain drug and property crimes, and decrease some other mandatory minimums. Remove the violent crime designation from some offenses and lessen habitual offender penalties. Form a task force to evaluate the creation of a felony class system that would determine sentences by the seriousness of the crime. Extend parole eligibility to nonviolent offenders after they complete 25 percent of their sentences, prospectively and retroactively. Extend parole eligibility to juveniles sentenced to life for second-degree murder, retroactively. Establish medical treatment furlough for all incarcerated people, except for those on death row, prospectively and retroactively. Decrease probation and parole terms for nonviolent offenders. Tailor fines and fees to a person’s ability to pay. Forbid incarceration or driver’s license suspension for people unable to pay fines and fees. Restore eligibility for food stamps and temporary financial assistance for former prisoners. Streamline the process for people with nonviolent felony convictions to obtain professional licenses. Reinvest 70 percent – nearly $184 million – of savings from reduced prison population into prison alternatives, programs proven to reduce recidivism and services to support victims. Download the Practitioner's Guide to the Justice Reinvestment Package here.